School has begun and we’re beginning to settle into a routine. As a celebration for the beginning of a new school year I’ve teamed up with Stacey from This Lil Piglet and Stacie from Simply Stacie to bring you the iPad Mini Back To School Giveaway. 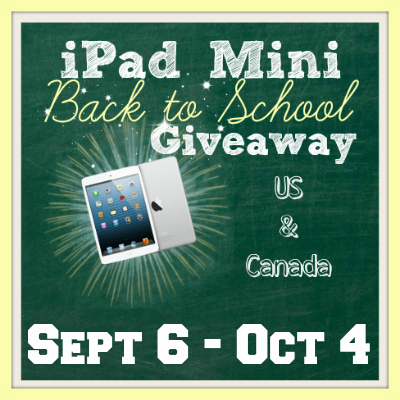 Why give away an iPad Mini to celebrate back to school? Well why not! I know someone will be thrilled to have this beautiful device, perhaps to steal a few minutes of their own to watch a movie on or surf the web when nobody in the family is vying for their attention. 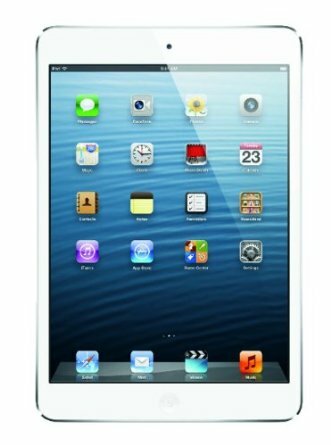 We’ve invited some fabulous bloggers in and we’ve decided to giveaway 1 16GB iPad Mini valued at $329. to one very lucky reader in either the US or Canada. You must be 18+ to enter, Winner will be drawn on October 5th and have 48 hours to respond. I’m so excited, good luck! I would love to win this because I don’t have a device like this. 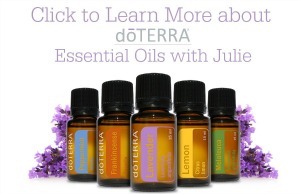 They are very handy and small that you can bring them everywhere with you. I would like to win this for my son with autism to use as a communication device :-) He’s my sunshine! Haven’t taken the leap to a tablet yet – this would be great. Everyone in my house (including my 8 year old son) has a tablet. I think it’s high time I see what all the fuss is about, lol! My oldest son would love this. technology. It would be amazing to use a device like this. I’d love to win this for my boys to use. They love playing games and reading so this would be perfect. I would love to win this for my son. His birthday is in November and it would be an awesome gift. Then we would not have to share our one computer. I would love to win a mini iPad! We do not own a device that is portable. It would be great for my business. I would love to win the ipad to give to my mom since her laptop has decided to stop working as it should & I know money is to tight right now to spend money on fixing it or getting a new one. I want it for myself, with all the appointments I have at the cross cancer with my dad and all the ones for me I can throw it in my purse and use it where ever I go to read or search for things I need. I would love one for my 7 year old son who has Autism. I would love to have an Ipad which I’ve never owned. I could use this for so many things and when I am on the go. I love that this is small enough i can hide under the covers and catch up on all my favorite PTPA blogaholics :) Thanks for the chance!! I would love this! GL everyone! I want to win this for my hubby as a christmas present. He does so much for our family and he has wanted one. I would LOVE to win one of these! I don’t own a device like this and I have heard such great things about IPADS! This would be the perfect size and I know It would be great for my children to use too! I’ve heard wonderful things about educational apps for kids and reading. Thanks for the opportunity! I want to win the iPad Mini because the only portable device I own is an old laptop that is not very portable. I’d like to win because I’ve never had a device of my own. Would be nice. Been wanting to give one to Mom. Because I don’t have one and would love to have one!! I want to win it for a gift for my son’s birthday. I have two kids with disabilities this would be a great tool to help them learn and get them closer to their goals! I have to share my laptop so selfishly i’d love my own anything ! Because mine doesn’t work well anymore. I don’t own an iPad and have wanted one for awhile, but if I’m lucky enough to win I will give it to my son. He would love it for school. I would love to win this because we plan to buy one for when we travel, and winning one would be better than spending the money! We want it for allowing the kids to play/watch some movies while on the road as well as for using it to upload photos and check emails as we go. Now that school is back in session I know that I will have to wait in line to get on the pc, would love to have this mini to beable to check my emails and do a little surfing! So I can get my ipad back!! This one would be shared by my kiddos! I want the iPad mini because my husband has Gen1 iPad that needs replacing and this would be perfect for him. It’s a nice size portable device that I can take with me when I’m out and about. i want this for my son. I would love to win this for my girls, they’re are becoming more technology savvy than I am. Would love to win this to keep up on social media and to blog on the go! I would love to win this device to be able to share it with my children. This would be so great to win I’ve always wanted one but could never afford it. I would love to win the ipad mini to help with my on the go sales with Stella & Dot Jewellery!!!!!!! I would like to win this so that I could read all of my downloaded e-books and use it to take notes for school. This would be great for my son! I could find some great learning apps for him! My kids dont have an ipad and I would love to win them this. I have recently gone out of work on SocialSecurity disability and I had to let my iPhone go but I gets lot of emails and would love to be able to read my emails and browse the Internet so the iPad mini would be perfect for me. Thanks for the giveaway for the mini iPad and all of the other giveaways you participate in so that we ( your readers)!have an opportunity to win new exciting items that we couldn’t obtain without your giveaways. Good luck to all. I’d love to win because I love Apple products and this would be a great gift for my niece! Would love to win for my boys as a learning tool and a little fun !! I would love to win this as it would be great to be able to pop it into my purse while I am travelling! I would love to win an Ipad 2 so that I can take it with me on the go for reading books and doing work. I’m having trouble subscribing to the blogs with the Mad Mimi links. I would really love to win this contest because I could really use this for school. I am without a personal computer, even though I take classes online (and let me tell you that isn’t easy haha). Also, I feel like an iPad mini would help me with my passion; filmmaking. I know there are lots of great filmmaking apps (like Slates, light monitors, call sheet apps etc.) on the Apple market that I’ve used on friends’ devices and they make all the difference! I would like one to be able to help me with my essays and other classes. I could also use it even in college.